Cube is a content management system developed by the Blue Chip Marketing Web production team. It is an ever changing product used to allow clients full access to their content needs once we provide full handoff. My role as the product designer began after Cube had already started development. I was challenged with improving the overall experience of cube to manage a large amount of content that required different needs. Upon log in how should users see their content organized and what actions should be enabled from the dashboard screen. 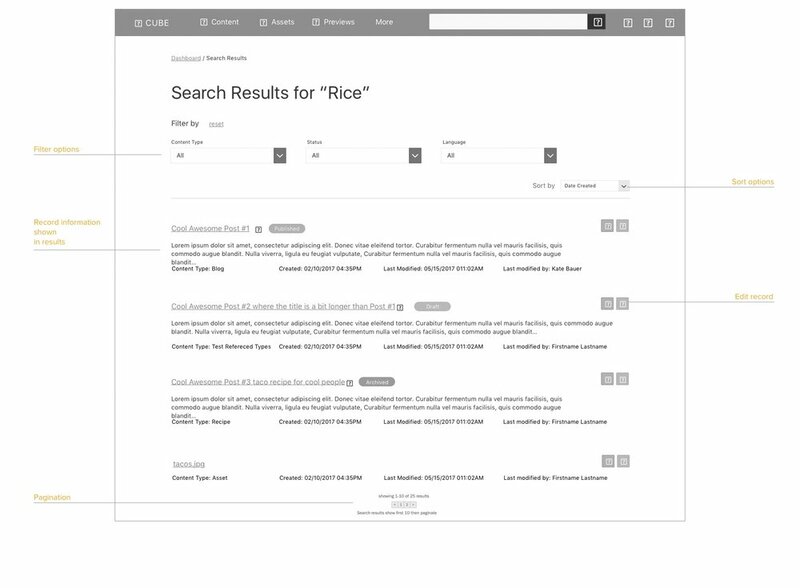 The capability to search all content within cube was very granular, it needed requirements to guide users search results. 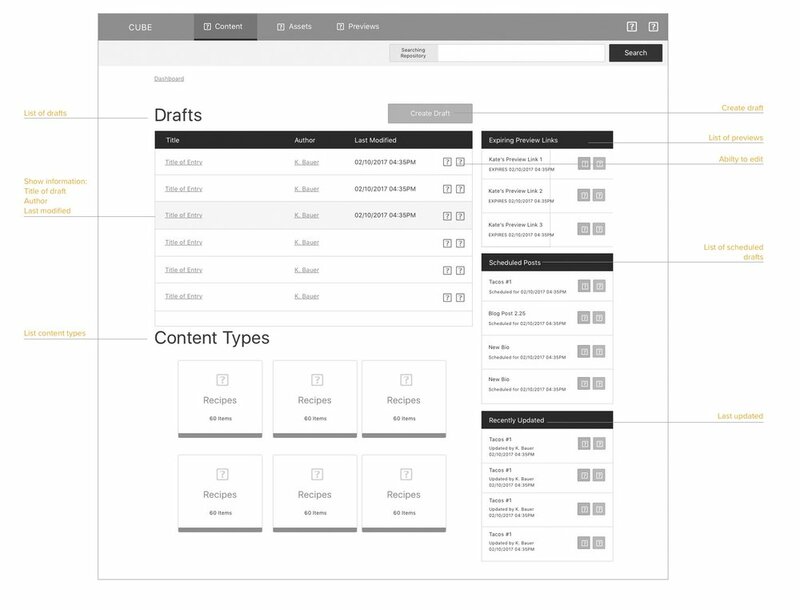 Records of content had a lot of functionality that needed to be streamlined to provide a more intuitive workflow. Through my evaluation I developed a sitemap to reflect how information on cube was organized. I used this as way to understand how that organization could potentially affect the experience of our users. I familiarized myself with existing content management systems and products that allowed content input of all kind. I talked with fellow members on the web production team and future users at Blue Chip to understand the full range of needs Cube should fulfill. Using the results of my research, analysis and discussions with potential users I created two main personas to help guide my exploration. Content Managers: This is our targeted user. They are responsible for updating, adding or editing website content. Client: The clients we service at Blue Chip Marketing have a wide range of content needs. Mapping cube to meet those needs is necessary for cube to be effective. Since my Initial work was done through a UX audit I began by working through workflows and use cases focusing on one feature at a time. This made it easier to explore multiple directions in each feature area, while gathering feedback from users and internal business stakeholders. Discussions with internal content managers I learned that upon login users not only wanted to have access to all their content but also wanted to see an overview of content as well. Working closely with our UI designer we were able to established a hierarchy of information using UI elements to help with the organization. I continued to work closely with our developers and UI designer to create filters that allowed users to narrow their results, and focused on the look and feel of the search results page. We wanted to provide users with enough information upfront to limit the amount of digging needed to find what they were searching for. Adding content to cube was relatively easy, but the options to control what to do with that content was confusing. 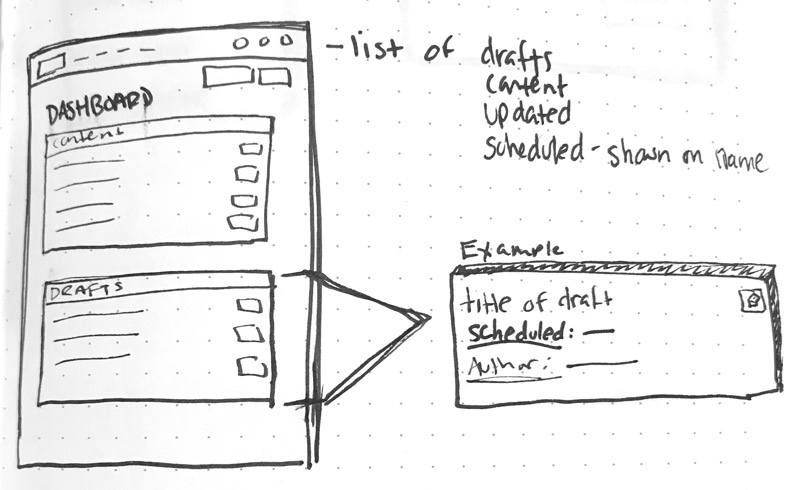 I Created a user flow to show the actionable items within a content record page. Records also contained drafts and revisions, which could also be scheduled to publish at a later time (needing a date/time selector). I needed to figure out a way to display all of this information within one record page, allowing users to see and access all functionality involved. 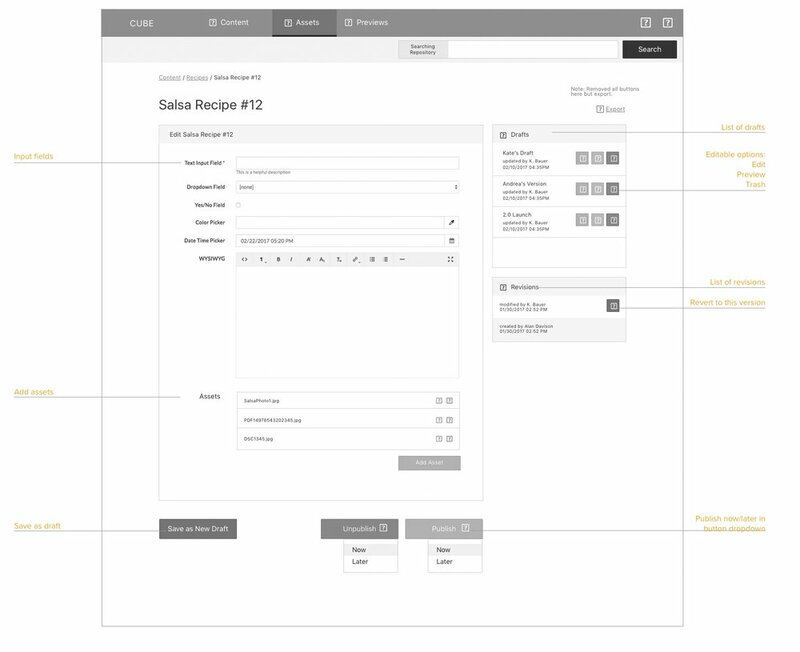 Our UI designer used my wireframes and developed a pattern library to guide the developers throughout implementations. Through further conversation and brainstorming we iterated on the existing designs to make further improvements to workflows which added simplicity and clarity. Cube was an excellent opportunity for me to work closely with the development team. We relied on each other to understand the requirements and feasibility of each feature. I have a huge appreciation for my teams willingness to work through multiple ideas while making sure the solution is best for our end user. Since Cube is still growing it was a great project to break production into manageable areas of focus. We worked as a team to prioritize features for now and also the future. Future work on Cube consists of: asset manager, import/exports and creating a product model that will help streamline over 56 brands being connected to Cube. The work with cube is not complete but with every sprint we build and create a bigger and better product. © 2018 Andrea Algiers. All Rights Reserved.